THE development of a precise, objective method of diagnosing Bovine Respiratory Disease in feedlot cattle is progressing, with preliminary results from a research project showing a high degree of accuracy in identifying the disease through a blood test. Bovine Respiratory Disease is the most common cause of illness and death in Australian feedlot cattle, causing between 50pc and 90pc of all sickness and deaths in Australian feedlot cattle. One Australian study involving six feedlots showed that BRD at the time of feedlot entry accounted for 66pc of all sickness recorded over an 18-month period. Identifying cases of the disease in cattle in a pen using pen riders is somewhat unreliable. The MLA/ALFA project, led by Associate Professor Luciano González from University of Sydney, has been identifying BRD using a diagnostic tool known as metabolomics. The researchers set out to explore changes that occur in the blood composition of animals with the onset of disease in the search for biomarkers to objectively define BRD cases. Associate Professor González said the Metabolomics of Bovine Respiratory Disease project confirmed that BRD could be identified using metabolomics, which is a field of science examining the metabolite profile of body tissues and fluids. 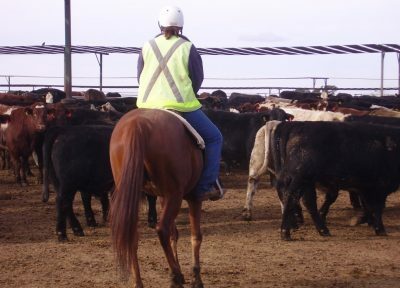 Researchers worked with a commercial feedlot in NSW in a trial involving 898 head of cattle, reflecting a mix of different breeds from different backgrounds. PhD student Claudia Blakebrough-Hall explained the methodology. “We took blood tests at induction and then again any time an animal was identified by pen riders as showing visual signs of BRD,” Claudia said. “Cattle with visual symptoms were removed from the pen, and for every sick animal pulled, a visually healthy animal was also removed so we could compare blood results, lung auscultation scores and rectal temperatures. The project examined blood samples from both sick and healthy animals to discover informative biomarkers. Researchers identified 12 different bio-markers in total that were associated to different clinical observations, but were able to determine a sick animal in the early stages of the illness with 85pc accuracy. This was completed using just one bio-marker on independent datasets which were not used in the initial search of bio-markers. All animals were followed throughout the supply chain to slaughter, to measure the incidence of lesions, adhesions and abscesses in the lungs to see if there was any evidence an animal had BRD. Other carcase information was also collected. “The trial demonstrated that when cattle became sick, it changed their metabolites in ways we expected. The composition of the blood of sick cattle reflected the visual changes the pen rider observed,” Claudia said. Professor González said there was scope to undertake more research that could possibly lead to the development of a simple crush-side test to help lotfeeders diagnose BRD. “Other research that could lead from this trial includes examining what are the metabolomic changes of an animal going through the disease process,” he said. The final report will be available soon. Click here to learn more about Bovine Respiratory Disease.